So apparently I'm really having a thing for white this spring. (See here.) I especially enjoy white when the pieces aren't just gauzy breezy and light. I love it when whites are tough, bold and a bit unexpected. My favorite iteration of this idea is a white moto jacket. Picture it with boyfriend jeans and black pumps. Picture it over a swingy sundress. Picture it with a pencil skirt and patterned button down shirt. No matter what you pair it with, anyone who sees you will instantly respect you, fear you and silently applaud your daring taste. 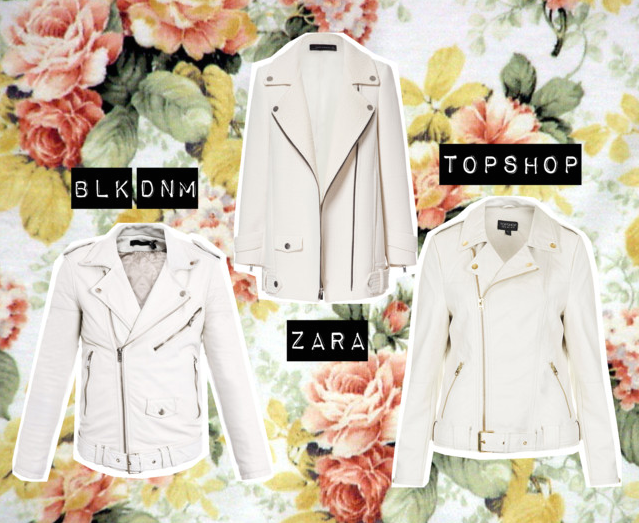 After all, white leather is not for everyone (but it's definitely for you). This is very daring, but I like it! The ZARA and TOPSHOP ones are great. I had been searching for the same thing earlier this year! I found a cute one at Forever 21 that was perfect because I wanted to keep the cost pretty low. All of your choices above are gorgeous! Just bought the Zara jacket and it's a dream.